Fitting scleral lenses is easier than ever with the Custom Stable line of lenses from Valley Contax. We’ve spent the past eight years refining and perfecting the Custom Stable to ensure it’s the most advanced scleral available on the market. Today, thousands of practitioners across the country use the Custom Stable as their go-to lens, and there has never been a better time for you to start fitting it too. Available in 14.8, 15.8, 16.8, and 17.8 mm diameter sizes, the Custom Stable is available in three variations. Our base design is the Custom Stable Prime, an easy-fitting lens with a symmetrical landing zone. The Custom Stable Elite combines the successful properties of the Custom Stable Prime with a bi-symmetrical toric landing zone that offers excellent comfort and customization. The Custom Stable Aurora is a front-surface multifocal – with the same back surface as the Custom Stable Elite – that uses a dominate (distance center)/non-dominate (near center) system that achieves all of the demanding vision of today’s presbyopes. With an easy-to-understand three-zone fitting system, making adjustments to your lenses is a straightforward process. Using a simple step system, you can adjust the Limbal Clearance Zone (LCZ) to increase or decrease clearance and/or the Scleral Landing Zone (SLZ) to dial in a perfectly smooth landing zone designed to align to the sclera. The Custom Stable line of lenses also offer an advanced, quadrant-specific system that allows the fitter to make adjustments to both the LCZ and SLZ on an individual quadrant basis. This allows the lens to fit even the most challenging corneas. One of the advantages of the Custom Stable is the ability to use our unique method of utilizing flat K as a means of selecting the initial starting lens from your fitting set. This technique is extremely accurate and makes it possible for anyone to enjoy great success fitting initial lenses, even if they do not have topography or OCT equipment available. Fitters also benefit from lasered diagnostic marks on the lenses that denote rotation and zone information. This makes it easy to quickly check proper landing, clearance, and rotation. 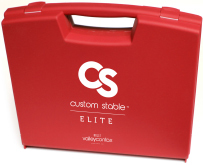 The Custom Stable is highly adaptable and is regularly used in a wide range of situations. Beyond irregular corneas that utilize the tear lens to correct vision, the Custom Stable is also very adept at bringing relief to regular corneas challenged by soft lens acuity or intolerance, as well as to those suffering hydration challenges. Because it vaults the cornea and allows a natural tear lens to form between the lens and the cornea, imperfections of the corneal surface are eliminated. As a result, eyes remain refreshed and hydrated all day long, for up to 14 hours – something that sufferers of ocular surface disease have come to love. In addition to providing extreme comfort, the Custom Stable also boasts best-in-class visual acuity. Wearers are often amazed at their ability to regain sight they thought they had lost forever. We understand the challenge fitters face when learning to fit new designs. Successful fits require not only great lens design but also a skilled and knowledgeable practitioner. This is why Valley Contax invests heavily in education, training and support. The Custom Stable Training Course is a great place to start! This 17-minute video covers everything you need to know about fitting the Custom Stable and is available at valleycontax.com. We’ve also assembled a team of eight regional education consultants across the country to provide support and answer your questions anywhere. These doctors are passionate about custom lens fitting, and you’re encouraged to reach out to them today. Visit the contact page on our website for more information. Valley Contax regularly offers hands-on training through our Custom Stable Fridays program at our state-of-the-art facility in Springfield, Oregon. These intimate sessions are perfect for the beginner who wants to learn the art of scleral lens fitting or the experienced fitter who wants to take his or her skills to the next level. When you’re fitting in practice you’re never alone – help is always available via phone, email, or chat. Our expert staff of in-house consultants is here to help you through every situation. 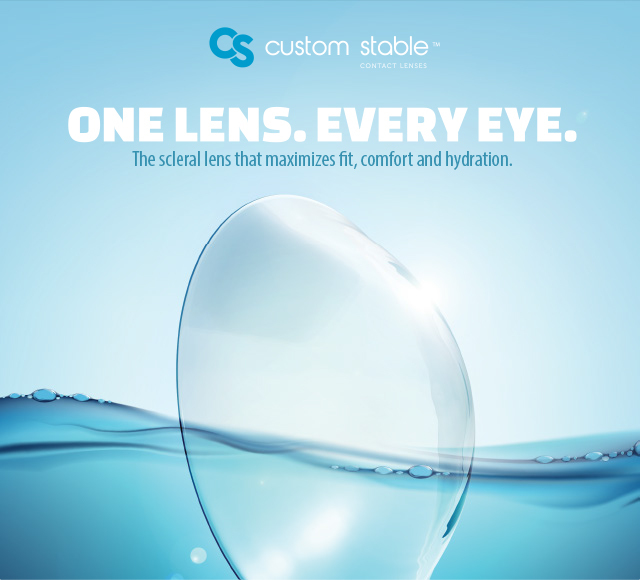 The Custom Stable is a breakthrough scleral lens that will transform your practice. With an advanced design it’s an easy and intuitive lens to fit that solves problems for a wide range of corneas - regular and irregular. Get started today by visiting valleycontax.com and watching the 17 minute Custom Stable training video. World Sight Day (WSD) is an annual day of awareness held on the second Thursday of October, to focus global attention on blindness and vision impairment. World Sight Day 2016 was on October 13, 2016 and Valley Contax was a proud supporter.